We haven't seen Hush yet on Batman: The Brave and the Bold, but I think it's nigh time. Batman's back-breaking nemesis Bane passed from the comics to the movies and cartoons, and in this way joined the greater public consciousness as a Batman rogue. Hush has only just begun the same process with his migration to the Batman Beyond comics series and I'm curious to see this continue; certainly Paul Dini's work on Batman: Heart of Hush goes a long way toward defining the villain in terms of the classic Batman foes. While I believe we understood in Jeph Loeb's twelve-issue Hush that Tommy Elliott blames Bruce Wayne for the fact that Elliott's parents didn't die tragically as Bruce's did, much of the background on Hush's childhood is all Paul Dini's, including Hush's relationship with Peyton Riley, the new Ventriloquist that Dini created. Whereas in Hush, Loeb's villain remained mainly behind the scenes and used Batman's other enemies for his attack, Dini's Hush is not only central here, but brings with him minions, any army of Gotham's homeless and deranged dressed up like hospital orderlies. Put another way, with Loeb Hush was an adversary, but with Dini Hush becomes a theme villain, like Two-Face or the Calendar Man, and I've venture that thematicism posits him as a more traditional Batman villain than ever before. In Loeb's Hush (which I enjoyed), I'm unsure the purpose of the bandaged around Hush's face, aside from obfuscating whether Hush was Jason Todd; in Heart of Hush, Dini makes hospitals part of Tommy Elliott's overarching psychosis, from his enfeebled mother to his near-crushed dreams of medical school, and from the violent procedures he performs on himself to the surgical nature of the crimes he commits. Dini, to an extent, gives the Geoff Johns treatment to Hush, in that the character's outward crimes are a reflection of his inward trauma; even Hush's name, now, comes from the demonic whispers of his mother. I have elsewhere become bored with DC Comics's heroes and villains always having long-time connections. The concept is fine in general, but when Hal Jordan used to be Sinestro's friend and Lex Luthor grew up with Clark Kent and Professor Zoom has tortured Barry Allen since he was a child, it gets repetitive; I do, however, like Hush's deepened background quite a lot. 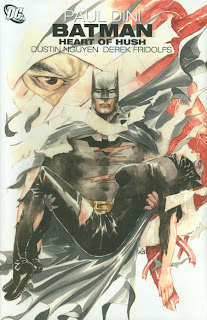 Batman stories sometimes have a tendency to focus on Batman's supporting cast because the story at its core doesn't require Batman to be there; Heart of Hush uses well the fact that Tommy Elliott knew Bruce Wayne as a child, and therefore Tommy can reach through all the trappings of Batman (as in the great scene in the Batcave) and interact with Bruce really on the most personal of levels. There's a greater emphasis on Hush than on Batman in this story than, say, on the Black Glove versus Batman in Batman R.I.P. Still, Dini includes some Batman scenes that -- knowing how long Dini has loved and written Batman -- I imagine he's waited a long time to write. One is the aforementioned Batcave scene, where Batman attacks Hush with the Batcave dinosaur, and the climactic battle takes place on the Whirly-Bat helicopter. This is zany fun somewhat out of place in Heart of Hush (as when Hush notes that Batman actually owns a whale! ), but it nicely smacks of the dark humor Dini interjected into the Batman cartoons. Another is some of the final scenes Dini writes between Batman and Catwoman, in which he gets to state definitively that Catwoman is the love of Batman's life. Potentially Dini had to grit his teeth as he wrote that ending, knowing what a big fan Dini is of Zatanna, but he puts a good cap on that relationship here, and affirms outright Batman's affection for Catwoman -- not that it's been a secret, but such a blatant discussion was probably long overdue. Heart of Hush is not really a sequel to Loeb's Hush, but it is fitting that the newest iteration of the Batman/Catwoman relationship that blossomed there should be addressed here as well. The Batman R.I.P.. title is plastered at the beginning of every chapter of Heart of Hush, but the connections between the two stories are spare. Presumably Heart of Hush takes place between the end of Batman: The Black Glove and the beginning of R.I.P., but one would have to tilt their head and squint to believe such (standard comics suspension of disbelief notwithstanding). Dini or artist Dustin Nguyen -- whose artist is gorgeously moody throughout the book -- also miss the look of Grant Morrison's "new Joker" when Joker appears in the story, sans bullet hole and scars. Heart of Hush factors in to later aspects of the Batman Reborn stories, but I'll say absolutely here that one does not need to read Heart of Hush to read Batman R.I.P. and vice-versa. Batman: Heart of Hush is a good, solid Batman story by Paul Dini, no less than what we've come to expect from the writer. It is not a triumph, in my opinion -- the conclusion, in particular, has neither the edge-of-your-seat bang of Batman R.I.P. nor of the original Hush -- but I think it's certainly notable for the emphasis on the characters; in particular, Dini's is the clearest portrayal I've seen of how someone as dark and aloof as Batman can also be a romantic figure. More reviews coming up. Thanks! Great review, CE (as always). Of the pre-Reborn Dini trades, I think "Heart of Hush" is my favorite. After "Hush Returns," I was a little wary of anyone but Loeb using the character, but I thought Dini was adventurous but respectful with Hush's backstory. What I love about this storyline is how brilliantly nutty Dini can be when he's at the top of his game; I'm thinking of Doctor Aesop and the little boy Scarecrow abducts, both of whom make appearances later in Sirens and Streets (respectively). Sometimes people knock Dini for writing too much like the 90s cartoon, but that's why I read Dini - for that experience. Vibrantly fresh. Love it. Dini is my fav Batman writer. I enjoy what Morrison is doing but I find Dini's work more fun and satisfying. What I enjoy most is his one-in-done style though HoH is a five-parter; but I like how you can get a great story in one or two issues. And lets not forget the amazing artwork by Mr. Nguyen and Mr. Fridolfs. Terrific work by those gentlemen; probably my fav artist team who draw Batman. They are also working with Dini on Streets of Gotham. My fav Batman trades of late have been "Detective" and "Death and the City." If you liked HoH, I think you'll enjoy what Dini's doing in Streets of Gotham as that being kind of like a "sequel" of sorts. I wrote a review for both SoG trades if you're interested? Much as I like Batman and Catwoman, to some extent I don't like the notion being stated outright that she's "the love of his life". Obviously, that's probably not going to hold up in the future, but even now it rings false and not just because of Zatanna. So, by saying that Catwoman is the only one who held his heart, what does that say about Talia? Silver St. Cloud (not the Kevin Smith iteration)? Kathy Kane (now that she's back in continuity)? So on, so forth. I don't buy for a minute that she's the only woman he's ever loved, so does that mean he's lying directly to Selina? How does that make him look? I do enjoy seeing the two's general romance and so on, but I'm starting to really dislike stuff like this, which seem to indicate that she's the one that "counts". It reminds me of the whole "Mary Jane Watson" road Spider-Man was on for the longest time there, where she was treated as the only love interest that mattered outside of the comics and occasionally as such inside. Despite the importance given to Catwoman, Batman's mostly avoided that, which is why stuff like that just grates me. Which is a long way of me saying that I'm not fond of that scene. Being honest, and I sense I'm in the minority here, I dug Dini's Detective Comics far more than Morrison's Batman. I felt Dini did justice to the various personas of Batman (detective, action hero, Bruce Wayne) without getting tangled in tht continuity. That said, I am enjoying Batman & Robin far more than Streets of Gotham, so maybe it balances out. I just love Dini's batman. He is intelligent, sure of himself, determined and dark but not whiny. He also has a certain dignity and weight to him. I love what Dini did with his batman work. Until now there have been six trades of his batman work. And these trades have all been very enjoyable and true to the character. It is one of the best yet overlooked runs on batman. I just wish Dini would get the recognition that he desreves. The story itself has it all. drama, suspence, romance and action. If you are even remotely interested in Batman, get this trade. The question of whether a hero should have a "love of [their] life" is an interesting one. Superman hasn't had a romantic complication in twenty years because everyone generally agrees Lois Lane is "it" for him; even when Superman dallied with Lana Lang, Lori Lemaris, or Maxima, the reader knows it won't last because Lois is "it." This has positives -- giving the DC Universe at least one high-profile stable marriage outside the Flashes -- but may also dull the title a bit, even as we all, again, still know Lois is "it." Aside from Superman, the question of an "it" is an ephemeral one, because if one writer says Green Arrow is "it" for Black Canary, another writer is going to come around and make it Dr. Mid-Nite. If comics ever end, however, I'd like to think one of Batman's final scenes is with Catwoman and not Talia or Silver St. Cloud (and, considering the Pre-Crisis Earth-1 Batman, that was essentially the case). Catwoman, in my opinion, is Batman's "it," and so personally I don't mind Dini saying so, since I don't think Dini saying so mandates that other writers can't write Batman in other relationships, as they surely will. That's how I see it. Indeed I'm one of those who thought Mary Jane Watson was Spider-Man's Lois Lane, his only love, told so by the fact that Mary Jane appeared in the Spider-Man movies. Here's, I think, "it-ness" run amok; Marvel made a commitment to Peter Parker and Mary Jane together just like they did Clark Kent and Lois Lane, when it maybe wasn't actually what the fans wanted, and then they had to erase it. Dare I say maybe Marvel's showing some courage that DC isn't by recognizing that a married Spider-Man limits their romantic storylines, and did something about it? Still everyone knows Superman will end up with Lois Lane, but I always thought we got to explore another good side of Clark Kent when he dated Cat Grant, for instance. Thanks everyone for your comments. I agree that Dini is "brilliantly nutty," and also lyrical -- I like all the references to Lewis Carroll and Aristotle, and the way a quote opens each chapter of the trade. I think there's a large difference when it comes to some characters. To me, whether there can be a "love of their life" or not depends largely on the character. The thing about Superman is that, well, Lois Lane was pretty much the primary love interest since inception and I really don't think anyone REALLY thought he would end up with anyone else. To go even further, she even had her own series titled "Supermans Girlfriend" for the longest time, which I thought wasn't really dancing around the subject. Where I find characters like Batman and Spider-Man different is that their love lives are a very important part of their mythos. They have many interesting love interests and when you tie them down, that closes a lot of doors and sometimes damages them irreparably (see Spider-Man, for whom the drama of his personal life was always important. For Batman, you've got girls like Zatanna, Talia, Catwoman, so on, so forth. For Spidey, there's Black Cat, Gwen (though not in regular continuity now, with the deadness), Mary Jane, Carlie Cooper and so on. Even with Green Arrow... there aren't really many girls in his life that even compete with Black Canary. He's kind of like another Superman; Ollie has the added wrinkle of being a womanizer, but there really isn't any other real competition for Black Canary. Same for the Flashes; there weren't really many others and they often weren't anywhere near as important. I guess what I'm trying to say is that having a "love of their life" for some characters is good and for others it doesn't really work. I do think Batmans one of them. Don't get me wrong, in alternate continuities or stories, I've no problem with him ending up with whoever, but I think in the main continuities it's subject matter that really should not be touched for numerous reasons. To be honest, if Dini hadn't had Bruce say "there was really only one woman who ever held my heart", I doubt I'd have an issue here, because that was the line that blew it for me. When I read this I was struck by what a great stand-alone trade it was, the best since... and the I realized how few great stand-alone Batman trades there have been in the last few years. Dini and Nguyen have crafted a thrilling tale, it's a pity they had to do it in the shadow of Grant Morrison's work.